You know you need a manicure when your hands start looking like Hugh Jackman’s in X-Men Origins: Wolverine. OK, so that’s an exaggeration. But my fingernails were getting pretty long, and my toenails could have given Howard Hughes some serious competition, too. (You know Hughes — that eccentric industrialist/aviator who let his nails grow like cat’s claws.) All right, so that’s a stretch as well, but the point is, I was overdue for a manicure and pedicure. I headed off to Nadwa Salon • Spa, which, until recently, was called Salone Nadwa and Day Spa. The business has been around since 1994, under the ownership of Nadwa Yono, a Chaldean immigrant who was driven by the desire to run her own business. Along with the name change came a new location. In March, the place moved from its longstanding digs in Novi to West Bloomfield Township, in the Boardwalk Shopping Center, on Orchard Lake Road. The location is smaller than the salon/spa in Novi, but it’s handsomely appointed. Less New Age-y in its décor than most spas, Nadwa has soothing Wedgwood-blue walls that suggest the ocean and the sky. Subdued modern fixtures illuminate the place. A long row of stones with candles interspersed among them is the only nod to the usual faux-Asian spa ambience. One side of the building is dedicated to a hair salon, but the ubiquitous throbbing music prevalent at most salons is muffled once you enter the spa side. Niran, who performed both my manicure and pedicure, greeted me as I walked in while toting a glass of red wine the receptionist had poured for me. Hey, this is a place to de-stress. It was. Instead of immersing my feet in a whirlpool bath, she applied a mango-scented foot softener, placed each foot in a plastic bag, then put each of them inside asoft rubber container. Then the whirlpool was turned on. It felt as if my feet were immersed in water, but they weren’t. I could feel the movement of the water, but my feet stayed dry. In this Australian hydrotherapy pedicure, exclusive in this area to Nadwa, there aren’t sanitary concerns because the water jets don’t get clogged, and the tubs aren’t exposed to possible bacteria. The only time the feet come in contact with water is at the beginning and end of the pedicure, when the feet are quickly and gently rinsed, which is preceded by a wild-plum exfoliating scrub. 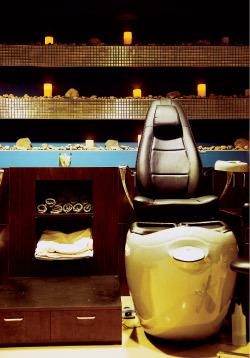 Your Spa Spy has never had a pedicure like this, but it works like a dream. After trimming the nails and buffing the bottom of my feet, Niran used an electric (not the usual manual) instrument to push back the cuticles. She then applied a pomegranate moisturizer. I felt like running barefoot through a field of grass, but my manicure beckoned. After my plastic mitts were taken off and the paraffin was removed, my hands felt soft as a cloud. Following the trimming and buffing, Niran let me choose a moisturizer from among a heated tray of cotton-candy-colored lotions. I chose lime zest, which she massaged into my thirsty hands. (I was beginning to smell like a fruit salad, but I’m not complaining.) Then, she applied a clear polish to the nails. Here’s another way Nadwa distinguishes itself. To expedite drying, my hands were placed under two small air dryers. No more blowing on the fingernails to hurry the drying. I’ve never had that treatment at another spa. Niran told me she has 15 years’ experience, 10 of them spent at Nadwa. It’s a background that shows in everything she does. Hours: Sun. : 9 a.m.-1 p.m; Mon. : 9 a.m.-3 p.m.; Tue.-Fri.: 9 a.m.-9 p.m.; Sat. : 8 a.m.-6 p.m. 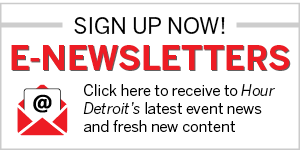 Hour Detroit Magazine brings you stories of regional interest along with the best restaurants, clubs, events and useful resources.